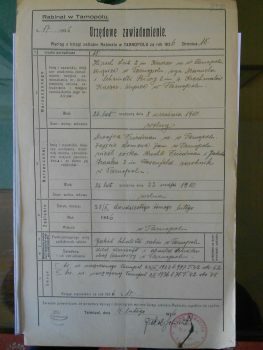 Marriage certificate from Tarnopol, of February 28, 1936. Source: Fond 424, File 155, at AGAD. Fond 424 is a collection of files of Jewish materials held at AGAD in Warsaw. It is a much smaller companion to Fond 300, which—as of November 2017—consists of 3,278 registers of Jewish metrical records (including index books, and duplicate books), nearly all of them from the eastern part of former Galicia. Fond 424, on the other hand, with under 200 files, contains vital records, but in loose form (such as death certificates, and marriage banns certificates), as well as other types of non-metrical records, such as financial accounts and other records of Jewish communities. Many of the files in Fond 424 are very short, in some cases relating to just a single person. Because the material is often made up of loose sheets, a file may well be incomplete for the period it is supposed to cover. Most of the towns, as with Fond 300, are from the eastern part of the former Galicia. Three are from the Volhynian area or the former Bukovina (all outside Galicia) and there is also a small amount of material from Kraków and Przemyśl. None of the files in Fond 424 have previously been microfilmed or digitized. Scanning. Gesher Galicia will scan around 130 of the present set of files in Fond 424, including all those considered to be useful for genealogical research. Indexing. Gesher Galicia has already indexed over 100 of the files in Fond 424, though some of these have not yet been put onto the freely searchable All Galicia Database in their most recently updated form. A further 15 to 20 files will be indexed in this project, and all the spreadsheets, including earlier ones, uploaded to the All Galicia Database. Availability to members. All the sets of scans that Gesher Galicia is acquiring, and all the spreadsheets, will be made available to members in the special Members Portal. It is hoped to finish this project by mid-2018. This is a costly project. All donations, of whatever size, will be greatly appreciated and will enable us to take this project to its completion. As always, we cannot guarantee in advance whether a particular record set will be complete or whether it will contain information of interest to a particular researcher or donor. Any donations by credit card or PayPal may be made online at the Gesher Galicia website, by clicking here. Sunday, March 10, 2019, from 11:00 a.m. to 1:00 p.m. Meeting of the Jewish Genealogical Society of the Greater Miami, at the Greater Miami Jewish Federation, 4200 Biscayne Blvd, Miami 33137. Andrew Zalewski will present GALICIAN PORTRAITS: THE STORY OF JEWS, GENTILES, AND EMPERORS. Wednesday, March 13, 2019, from 1:00 to 3:00 p.m. Meeting of the Jewish Genealogical Society of Palm Beach County, Florida, at the South County Civic Center, 16700 Jog Road, Delray Beach. Invited talk by Andrew Zalewski who will present GALICIAN PORTRAITS: THE STORY OF JEWS, GENTILES, AND EMPERORS. This event is free and open to the public. To see additional details and reserve your seat, please click here. For additional details, please click here. Click here for the full program of the Symposium.